Start Game4You and choose Build game (Quick mode). Add your photo and audio files, set number of buildings and click to 'Create game'. 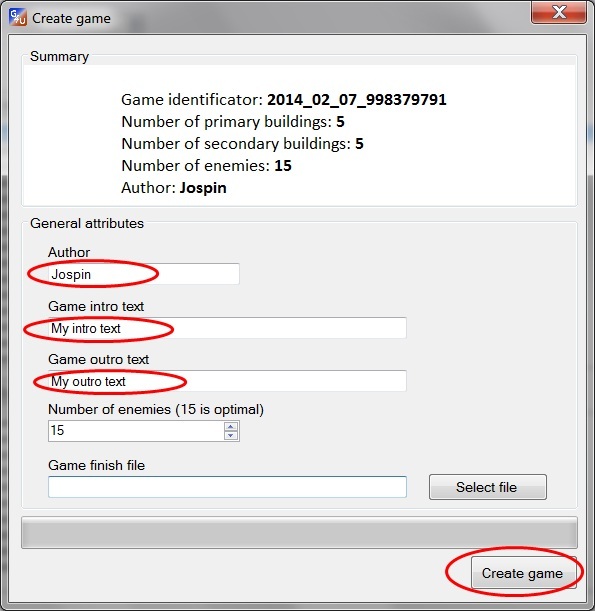 In the Create game dialog set general attributes (optional) and then click to Create game. After creating and saving the Game4You file, you can play your game or send file to your friends. If you want to put your questions and answers into game, use Build game (Advanced mode). The player must then enter a valid answer in order to continue to the next building. If you want to insert your file which is available at the end of the game use Select file button in Create game dialog.